These superficially similar looking birds with long straight bills are described as resident on Arran, with numbers increasing in the winter as birds move here from the colder continent. Woodcock, as the name suggests, prefer woodland areas in the breeding season while the smaller Snipe prefer damp or marshy grassland and wet bogs. While the concealed nests and camouflaged birds mean that nests are difficult to find, breeding for both species can be detected by looking out for their characteristic display flights. These display flights are each in their own way fascinating. The Woodcock flight display is referred to as "roding" and often happens towards dusk when the birds fly in a wide circuit above the trees marking out their territory. Snipe flight display is referred to as "drumming" when the birds generate a sound from their vibrating outer tail feathers. Again towards dusk or dawn or after light rain are usually good times to hear this sound that can fill the still air. 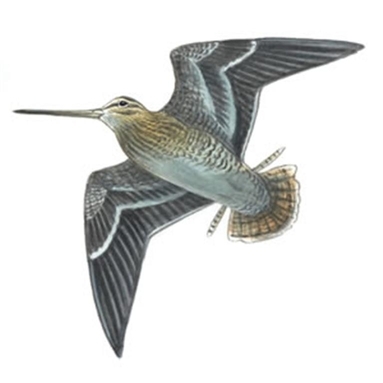 While I have had reports in the 2010 breeding season of "roding" Woodcock, I have had no reports of "drumming" Snipe. If you come across either of these display flights, I would appreciate it if you would take a moment to tell me where and when.